A couple weeks ago I posted a rant on some badly edited ebooks I had bought from Baen, thinking that they were unique examples of how publishers don't do their jobs. Today I learned that is hilariously wrong. Philip Howard, a bibliophile living on Ocracoke Island, NC, was recently rereading Tolstoy's War & Peace when he encountered a rather odd error. Philip had started the 1100 page translation on paper, but about halfway through he had the good luck to get a Nook as a gift. Given that the paper copy was the size of the phone book for a metropolitan area, Philip was eager to buy a replacement copy of the book. It only cost him a buck, so clearly it was worth it. In case it's not clear, what happened here is that someone used a simple find and replace program to remove all references to "kindle" and replace them with the word Nook. This isn't as nefarious as you might think; there's a chance that this publisher has an about page in their ebooks which might have mentioned the device it was sold on (Nook, Kindle, and so on). Someone clearly wasn't thinking things through when they did this. Philip thinks this is the work of some nameless drone inside B&N, but that seems unlikely. 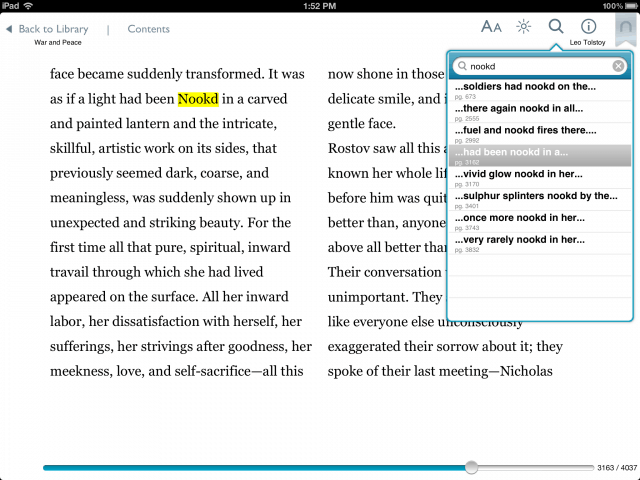 The word "kindle" is not uncommon so if B&N had done this we would have long ago heard about this error. No, it seems more likely that this was a publisher error. But what an error. According to Ars Technica, this happened a total of 8 times in W&P. Okay, this isn't a big deal, but I find it fricking hilarious nonetheless. How is Barnes & Noble handling this? Swapping the edition, punishing the publisher?